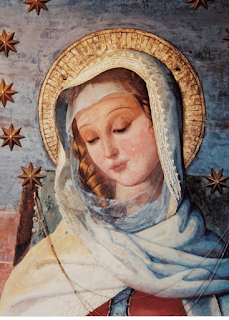 Within the wide world of the Society of the Sacred Heart, today is the feast of Mater Admirabilis, an image of Mary as a rosy-cheeked young girl, caught up in contemplation and serenity between various everyday tasks. But in the even wider world of the Church today is an ordinary Thursday, and so those of us attending Mass in parishes and chaplaincies will hear the ordinary readings of the day - readings which are not designed to be about Mary or Mater. Because surely if anyone was filled with the utter fullness of God it was Mary! Filled with God's fullness in her contemplation and stillness, and thus filled with God in her busyness, and her life as a wife and mother. She was someone who was undoubtedly planted in love and built on love: someone who, in all she pondered in her spacious heart, was able not just to grasp but to understand the unbounded extent and depth of God's love; someone who allowed God's power to work in and through her. And thus, not only during her pregnancy, when she bore God within her, but in every moment before, during and after, she was - as Gabriel proclaimed - full of grace, because she was full of God; and full of God because she was full of grace!